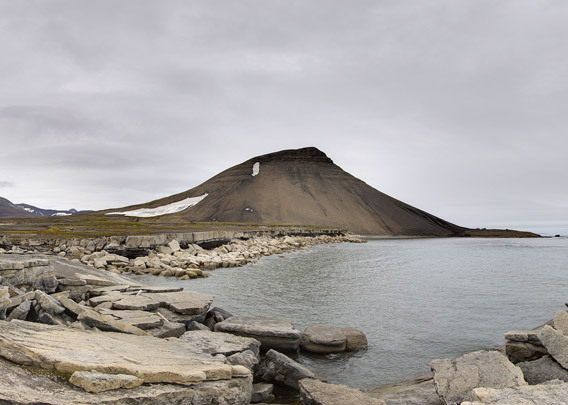 The bay Kvalvågen is on the east coast of Spitsbergen. It is easy to reach in winter by snow mobile (but this is only permitted for locals or with special permission). 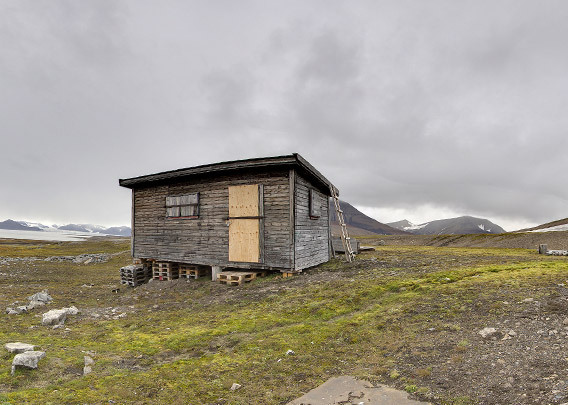 In summer, the east coast is, well, not further away, but much more remote, as it is more difficult to get there and the area is much more rarely visited then. The rocky shoreline does not exactly offer many well-sheltered landing sites, and landings are only possible in calm weather and sea conditions. Landing site at Boltodden (Kvalvågen) on a not very hospitable rocky coast. The rocky shoreline is geologically interesting: the rocks are sandstone, delta deposits of rivers that were flowing there almost 130 million years ago (lower Cretaceous), building up their river mouth sediments over large areas, similar to the Mississippi river delta today. 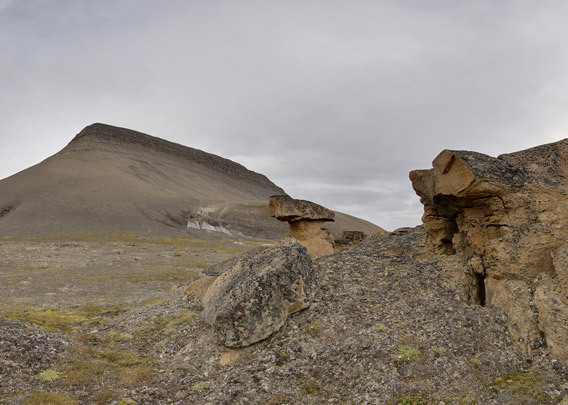 This sandstone can be found in many places in Spitsbergen, it is well known from several sites in Isfjord including Bohemanneset (where you can see the coal seams quite nicely) and Festningen west of Grønfjord, where this sandstone, the “Festningen sandstone”, also got its name. 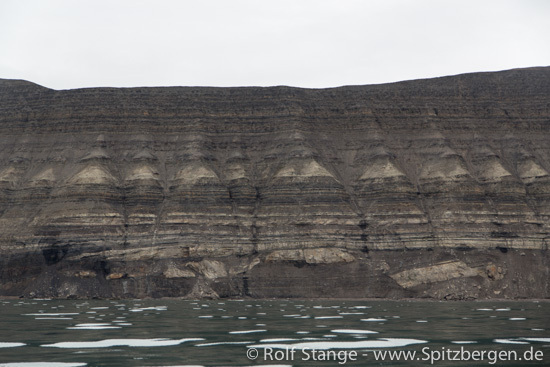 Coastal cliffs outside at Kvalhovden (viewing east) with layers from the lower Cretaceous: Helvetiafjellet-formation including the Festningen sandstone at the bottom, overlain by the Carolinefjellet-formation with its darker, more fine-grained sediments. Noteworthy are also the growth faults at the bottom: large blocks of sandstone that moved within the surrounding mud which was not yet solidified, shortly after deposition. In other words, faulting induced by gravitation and not by tectonics. 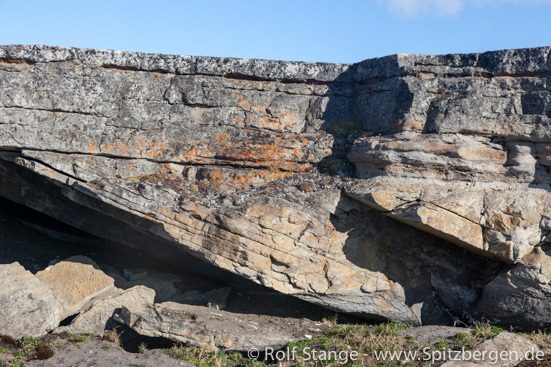 To be precise: the Festningen sandstone belongs to the Helvetiafjellet formation (named after a mountain in Adventdalen), which again is part of the Adventdalen group, to work our way through the local stratigraphic hierarchy. Internationally speaking, the time of deposition of the Festningen sandstone happened during the Barremian (130.7-126.3 million years ago), which is part of the lower Cretaceous. Just in case you wanted to know. Detailed view of the Festningen sandstone with cross bedding. Coast of Boltodden, Kvalvågen. 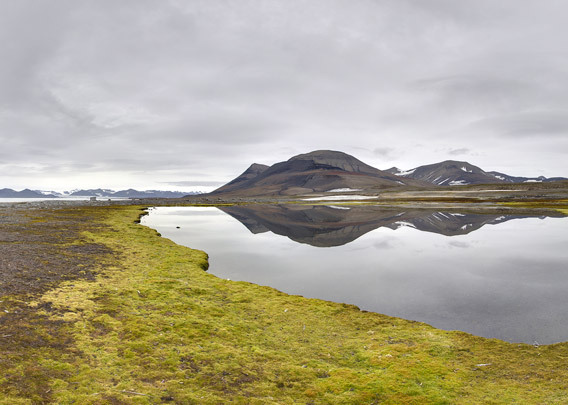 Lagoon with mossy shore on the flat land near the coast at Boltodden. Hut at Boltodden, Kvalvågen, view to the west. 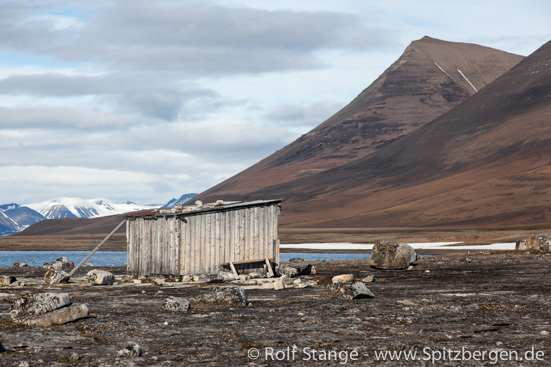 This is the older one of two huts near the shore at Boltodden. It was probably built in 1923 by the British “Northern Exploration Company” (NEC) to claim the area in case coal or other minerals would be found later. The older (1923, NEC) hut at Boltodden, Kvalvågen. 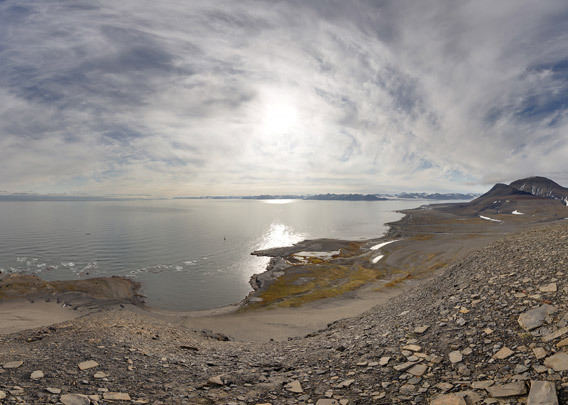 Again viewing west, but now with the lagoon in the foreground and the glaciers (Strongbreen) in the background. Inside the 1923 NEC hut. 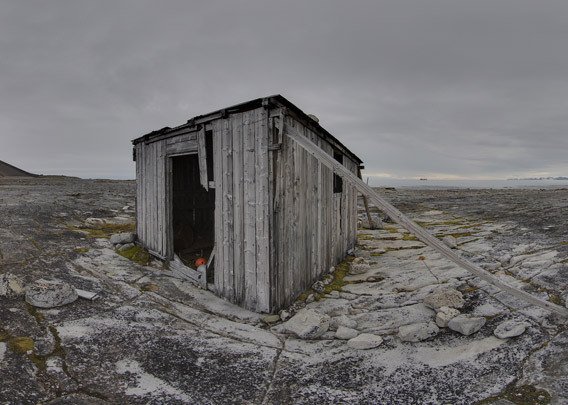 This more recent hut is a bit higher up from the coast. It was damaged in spring 2014, probably by a snow avalanche. Hope it will be repaired. 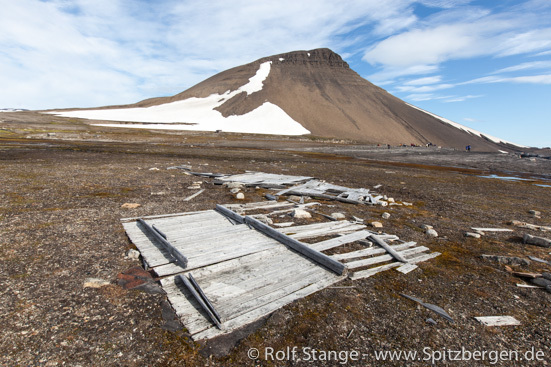 Ruin of yet another hut at Boltodden, Kvalvågen. 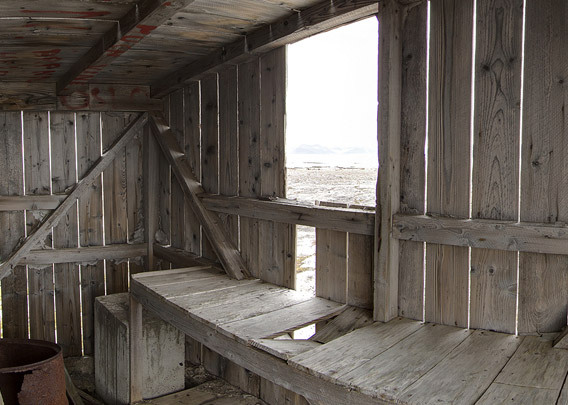 Maybe the one built in 1909 for a wintering by the hunters Einar Johan Pedersen and Arne Jensen Sommerø. The latter had to cut off some of his toes damaged by frostbite during the winter, he left them in the hut when they left in August 1910. 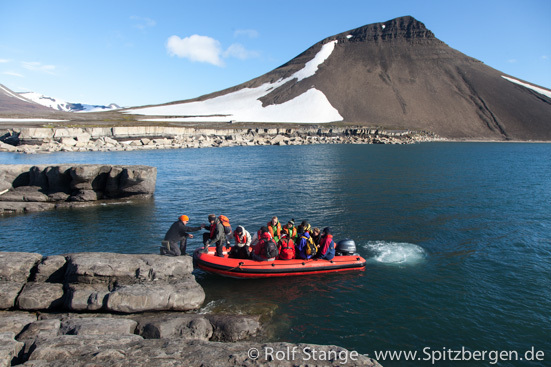 They rowed with a small boat all the way around Sørkapp to Isfjord and Longyearbyen (then still Longyear City) as no ship came to pick them up. After a little walk into the valley Kvalhovddalen and ascending about 250 metres to the southern end of the mountain ridge Kvalhovden, you have this magnificent view all around you. The wide Storfjord to the east with Edgeøya on the horizon. 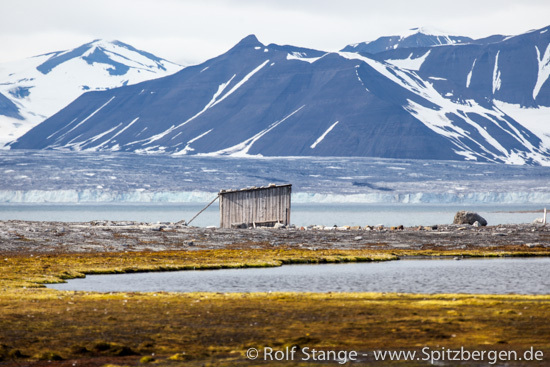 The east coast of Spitsbergen stretching into the far distance to the north and south. The glacier Strongbreen, its feature that mostly deserves being described as “strong” being the strong retreat of recent years, in the west. 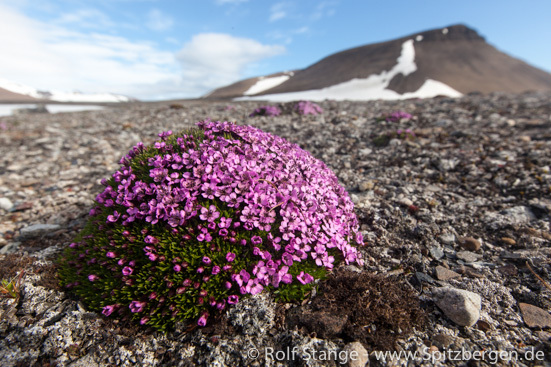 The best part of it all may be the rocky coastline that you have nearby, Boltodden and Sporodden. 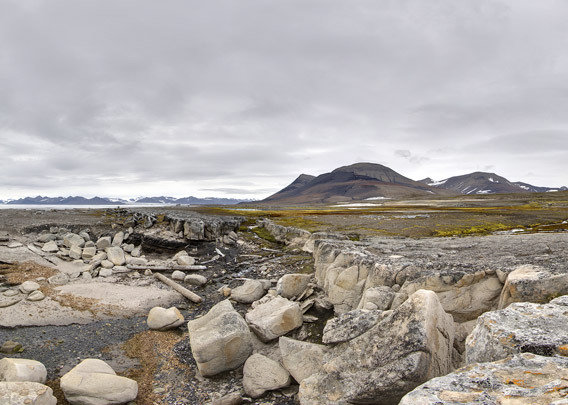 These two last panoramas are from Sporodden, some hundred metres east of Boltodden. As the name (“track point”) tells, this is where geologists found dinosaur tracks. These dinosaurs, carnivorous ones as opposed to the vegetarian Iguanodons who left their tracks at the same time at Festningen (Isfjord), walked around here (which was further south) when the Festningen sandstone was still a soft river delta of white sand, surrounded by swamplands with forests. 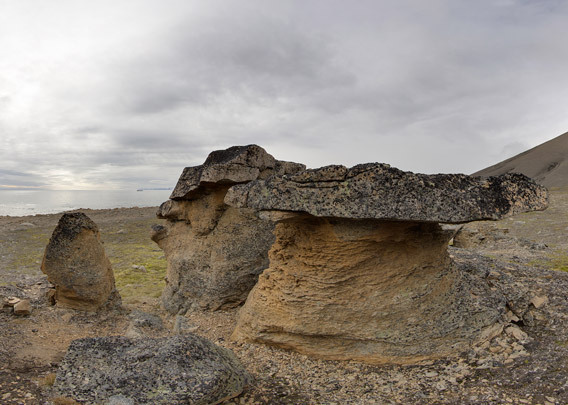 Today, Sporodden provides an interesting, beautiful scenery even if you don’t find the dinosaur tracks (I haven’t yet, but next time …), with some mushroom-shaped sandstone rocks quite reminiscent of Colorado, if it was just a few degrees warmer. Dinosaur footprints at Boltodden, Kvalvågen. 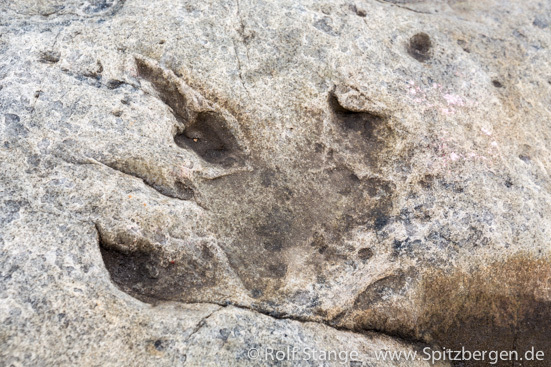 About 30 cm large footprints of the cretaceous Iguanodon, a vegetarian dinosaur species.